There’s something so romantic about a rooftop wedding overlooking the most historic city in the U.S. and a night spent dancing with the love of your life under a star-filled sky. As soon as Chris and I stepped foot onto the rooftop at The White Room in St. Augustine, FL we knew it was just what we had been looking for. With beautiful wood floors, natural light, gorgeous textured brick and an amazing view of the water this historically rich location provided the perfect setting for our special day. Florida weather can be unpredictable in April so we loved that the guests had an option of being outside or inside depending on the temperature. Like many soon-to-be brides I had a Pinterest board filled with inspiration. With many trips to Home Goods, Michael’s and Hobby Lobby my mom and her best friend Kathy helped to make my Pinterest vision a reality. A few of my favorite DIY elements included the seating charts (two large black frames with a chevron background and pink name tags hung in an ombre pattern with tiny gold clothespins) and the tablecloth under the cake (a black and white stripe skirt with a white scalloped overlay that was sewn by my mom and hemmed by hand by my grandmother). One of the best parts about adding DIY elements to your wedding is that you get to involve your family and friends in the process. My mom and I hosted a craft day and invited the women in my fiancé’s family to help us assemble mints with custom-made stickers and mason jar favors. At a time when wedding planning can be stressful it’s nice to laugh a little and bond with family while getting items on your to do list checked off. My grandmothers, aunt, and cousin were also an integral part of the process. They came into town a week before the wedding to help assemble candy favors, programs and many other crafty details. My dream dress was actually the first dress I tried on. It was a classic taffeta dress with pockets and a big bow that tied in the back. It was not so easy finding a veil. I was looking for something fun and a little more updated and I knew I wanted a funky pin to go with it. When I found the veil and feather pin on Etsy it was like the designer had read my mind. One of our top priorities was to hire a professional and creative photographer. Brooke Images featured photographs that looked like something you would see in a wedding magazine. What we really loved was that Greg and Ashley were a husband and wife team who so obviously had a passion for telling the love stories of others through photos. Our expectations were far exceeded when we received our CD of photos. The centerpieces, boutonnieres, bride and bridesmaid bouquets were designed by the talented Karen of 57 Treasury. Karen is truly an artist who paints with flowers. She took my ideas and combined them with her artful vision to create a wonderful mix of flowers in every shade of pink that perfectly matched my color theme. Our wedding cake was designed by Arlene from Sweet Weddings. She created a fluttery three-tiered cake with a delicious key lime layer (my husband’s favorite) and two chocolate raspberry layers (my favorite). A tiny gator tail poking out of the bottom of the cake was a nod to the groom’s alma mater, the Florida Gators. Our cake also featured a monogram H topper we found on Etsy and a few pink flowers to tie into the color theme. Totally, beautifully, utterly, gorgeous don’t you think? 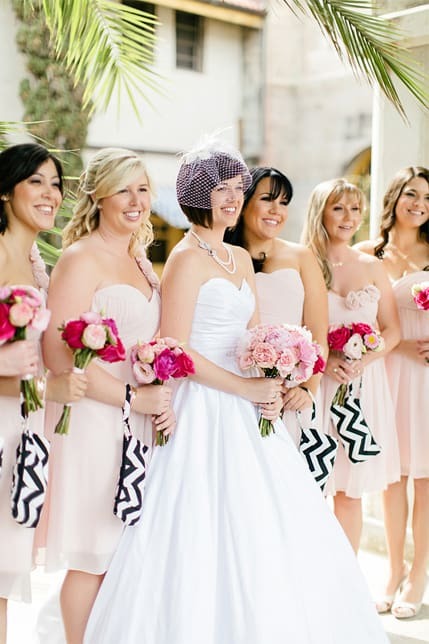 I love bridesmaid’s handbag and It really adds the extra oomph to the Photograph!! Awesome color combination. beautiful wedding! i like it!